Powered by Science. Filled with Awesome. Sun Scout is for everyone who cares about the sun. Sun Scout shows you live what your phone's camera sees, but augments the image with where the sun will be at each hour of the day. To see everything that might cast a shadow on you, simply sweep your phone across the sky from dawn to dusk. 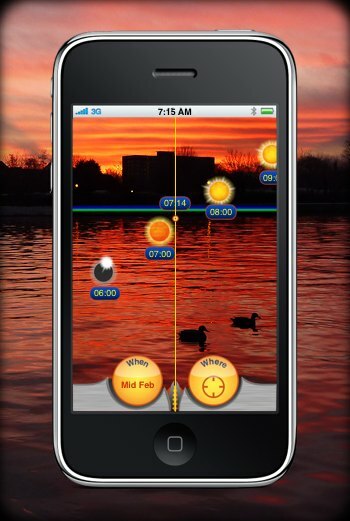 Sun Scout is available for iPhone 3GS, 4 and 4S on the App Store. Sun Scout needs at least an iPhone 3GS as it uses all the phone's sensors, including the GPS and compass. Shooting photos or film? Know when you'll get ideal light and shadow. Buying a house? Check the rooms and garden for sun traps and shade. Enjoying a day by the pool? Find the best spot for your towel. Hosting a garden party? Position the lounger in the sun and the beer fridge in the shade. Parking in a heat wave? Leave your car so you return to find it in cooling shade. Planning to see the sun rise tomorrow? Know where it will rise as well as when! Heading to the mountains to hike or ski? See when the peaks will leave you chilly in their shadow. Pitching your tent? Make the most of any available early morning shade. Sun Scout relies on the magnetic compass in your iPhone. For best results, please regularly calibrate your phone's compass. Check out this video to see how. Even when calibrated, the compass in your phone will be strongly affected by metallic or electrical interference. In particular, interference can come from power cables and steel reinforcing in buildings, or the metal bodies of cars. You will find that Sun Scout and other compass enabled applications work best when you are away from any interference. We'd be thoroughly delighted to hear what you're getting up to with Sun Scout. Give us a shout on Twitter at @sunscoutapp, email us on sunscout@sunscoutapp.com, or drop by on our support page, and let us know the awesomeness you've achieved! How accurate is Sun Scout? To get the best from Sun Scout we very strongly suggest that you follow the instructions in our calibration video. If you've not calibrated in the last 24 hours, then do so when you start Sun Scout. The limiting factor for Sun Scout is the accuracy of the electronic compass in the iPhone. This suffers from interference, being affected by metal or strong electric currents near by. When calibrated, and in the absence of interference, Sun Scout's results are very good. Also, the compass only effects the horizontal tracking of the Sun. For vertical tracking the accelerometer is used, and this is extremely accurate in our experience. What is the yellow line through the screen for? This is to let you read off the time when the sun passes a particular point. You could align the line with a building's edge, or a hill, and see the time that the sun will pass that point. Does Sun Scout let me see the sun for days other than today? Absolutely. You can tell Sun Scout the date in the year that you are interested in. You can't yet set a specific custom date, but we expect to add this as a feature provided there is demand. Can I see how the sun behaves in other locations? Yes. For delectation and enlightenment, Sun Scout lets you virtually travel to Earth's extreme poles, or for a warmer experience, to the Equator. It will show you the very odd path that the sun takes there; circling around and around endlessly, or flying like a rocket to the heavens and then straight back down. What sensors does Sun Scout use? To build an Augmented Reality view, Sun Scout uses your iPhone's camera, GPS radio, three axis magnetometer and three axis accelerometer. It samples them simultaneously and continuously to keep the synthetic view up to date. We'll certainly try! Get in touch at our support page at Get Satisfaction.